The term “stem cells” is a phrase that is often mentioned when discussing alternative treatments for orthopedic injuries and many other medical conditions. However, many people do not fully understand what stem cells are, where they come from, and how they can be used. Another common source of confusion is that there are several different kinds of stem cells that are used to treat musculoskeletal issues. The three different kinds of stem cells we will discuss in the upcoming articles are adult autologous stem cells from bone marrow and fat, non-autologous placental products, and embryonic stem cells. Adult autologous (from your own body) stem cells are the most common type being used in orthopedic cases today. The specific types of adult stem cell that are being used to treat musculoskeletal conditions are called mesenchymal stem cells (MSCs), pericytes, and hematopoetic stem cells (HSCs). These are multipotent, meaning they are able to differentiate into different types of tissue and can regenerate bone, blood, cartilage, tendon, muscle, ligament, intervertebral discs, and fat cells. This type of stem cell is ideal in the treatment of advanced arthritis, cartilage, muscle, tendon, ligament, and disc injuries. It is being used with very good evidence to treat early avascular necrosis (AVN), a condition resulting in bone death from lack of blood supply to the bone. Physicians may choose a bone marrow source of stem cells to treat their patient’s musculoskeletal condition. We have mastered the ability to obtain the bone marrow cells very comfortably with the use of nerve blocks and local anesthesia. The bone marrow is then processed in our lab, concentrated, and counted to make sure an optimal amount is obtained for treatment to assure a good prognosis and outcome. In case our patients have a less than ideal cell count, we have the option to add another cell source to their case to help ensure their treatment will be as effective as possible. A patient’s bone marrow concentrate is injected into their area of treatment using expert guidance with high resolution ultrasound and/or fluoroscopic guidance as soon as possible after the cells are processed. This is done the same day as the bone marrow aspiration due to the fact that the longer a stem cell is outside of the body, the less effective the healing capacity becomes and the FDA and state regulations do not allow a stem cell to be stored for later use in the United States. With the extensive recovery time, risks, complications, copays, deductibles, and out of pocket expenses that come with surgery, adult bone marrow stem cell injections are a less risky, and often cost effective alternative to a joint replacement or other musculoskeletal surgical repair. Our patients seek us out because we offer progressive treatments to help them regain their mobility and function without surgery! Visit www.drshiple.com for more information and see why doctors choose Dr. Shiple to perform their cellular medicine treatments as an alternative to surgery. “Have you been told you need a knee replacement or are you living with extreme pain from arthritic joints? Before you have anything replaced or waste your time on conventional treatments please read my quick story. I am a retired pro bodybuilder and I had given up on living a normal life, let alone working out due to severe knee pain. I went the orthopedic route with no success and it was determined that my only option was a knee replacement. 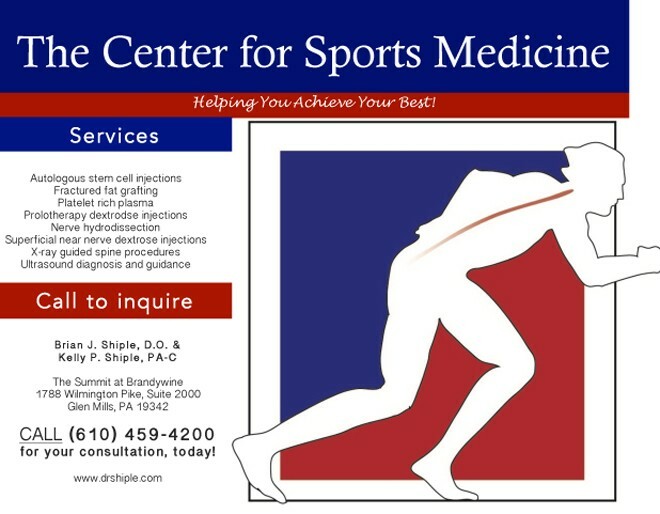 This is when I began to look for other options and came across The Center for Sports Medicine. After a thorough examination to include diagnostic ultrasound we decided that I was a candidate for stem cell therapy. We proceeded with the stem cell treatment and after the recovery period I was able to resume training and live without constant knee pain for the first time in 12 years. Maintenance treatments were necessary every once in a while due to my intensity of training, but for these 4 years I was virtually pain free and training at a very high level. Nine months ago we did a second stem cell treatment and with only one week of rest I was able to return to my workout schedule. Since this treatment the knee is completely pain free and I have increased the intensity and volume of training very close to what it was when I was a competitive pro bodybuilder. I couldn’t be happier with the results and the care that I get at the clinic is the best in business! Dr. Brian Shiple is a highly accomplished sports medicine and family practice board certified physician. Dr. Shiple is one of the leading interventional regenerative medicine physicians on the east coast and uses platelet rich plasma and adult stem cells for the healing of musculoskeletal conditions. He has been practicing age management wellness and aesthetic medicine for over 8 years. He has been in practice for 22 years and is a highly sought after speaker, educator, and author.